I enjoy reading biographies of great men. Doing so gives me insight into some of the brightest, most creative, and successful men whom have lived. Some of these men lived long ago, yet their life story becomes a lesson applicable for today. Other men are still living and willingly giving us the secrets to their achievements. Not only do we see their genius on display but we often learn how the traumas of their youth motivated them. These men often share their failures in business and finance, even marriage and family, and provide key insights into overcoming setbacks. You can gain wisdom through a mentor or through pain. I suggest you choose mentors. Through the mentorship these biographies of great men have afforded me, I have discovered seven habits of effective men. 1. Effective men steward their time. Most effective men start their work at the same time each day. Most have a reflexive system of managing their routine. For example, Nick Saban, the very effective football coach has mastered the proficient use of his time. Read this article to see what I mean. 2. Effective men are constant learners. The greatest habit I ever developed in my life is reading one chapter of Proverbs each day. I learned this from the very effective Zig Zigler. He valued it so much that he created an audio version for us. Available here. 3. Effective men speak positively. 4. Effective men focus on details. Small things matter and small things overlooked are often the destroyer of greater things. Focusing on the details makes all of the difference. I have known very gifted men who were sloppy in the details. Their success is constantly undermined by their lack of attention to detail. You cannot expect an excellent life with 80% effort. The physical body is a machine—a remarkable machine—that houses who we are. We must invest in it. We must care for it. It won’t last forever but it is vital for now. I continue to resist the effects that travel and a busy schedule have on my body. I want to be in the best physical health I can be in my 50’s. Yes, it is hard, but if I am going to accomplish my purpose in life I need to be strong for another thirty years. God established it, even commanded it. It is as vital for your effectiveness as breathing—it is called rest. Fatigue is the greatest threat to your future. When you are tired you let your guard down in decision making. When you are tired you are not focused on details, you do not control your words and may say things you will regret. When you are tired you are not creative. When you are tired you are vulnerable to a spiritual attack. Never make a permanent decision when you are tired. So how about it men? What are some of the best lessons that you’ve learned? 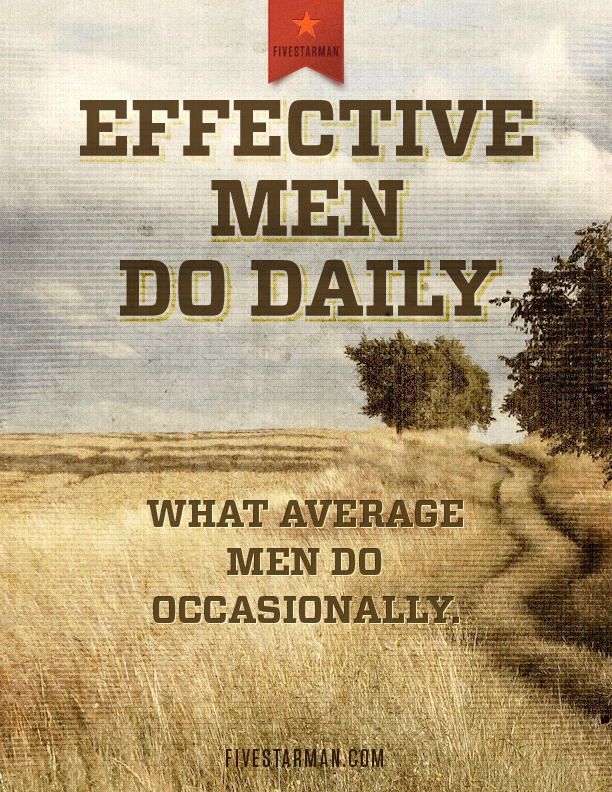 What effective habits have you noticed in other successful men? What effective habits do you need to work on? Share a statement with us, you will encourage other men. If every dad that has gone awol on their family, and returned to them, the social problems of our communities would disapear. If we men of God put on our armor and spread the Word, we could certainly make a difference in each of our own community.